CFL bulb not included. Floor Lamp Table with Shelves & Swing ARM help you to create a cozy, luxury, aristocratic, rich, unusual atmosphere in the room. Floor lamp dimensions 20"L x 16"W x 53.50"H and standing 53.5 inches tall serves as the perfect focal point to bring a classic and elegant finishing touch to your area. Luxury Floor Lamp with Table Attached multi-functional unit is ideal for the individual looking to Improve the house, optimize the space, add preciosity to your cozy corner. End Table Floor Lamp combines a luxury, espresso finish with a neutral shade to fit seamlessly into any decor. 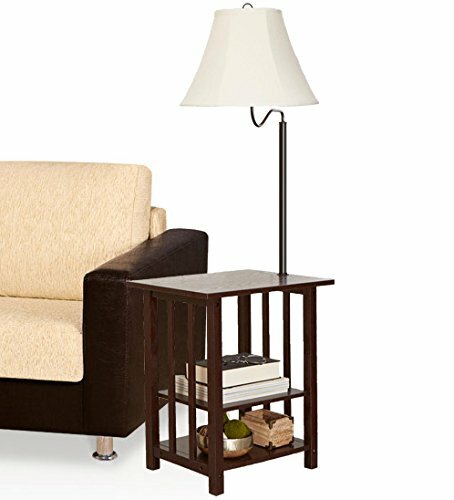 Floor Lamp Table with Shelves & Swing ARM help you to create a cozy, luxury, aristocratic, rich, unusual atmosphere in the room. If you have any questions about this product by TwoSpeedShop, contact us by completing and submitting the form below. If you are looking for a specif part number, please include it with your message.